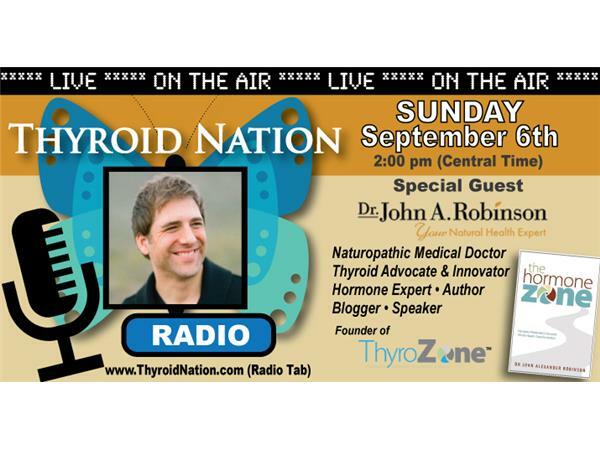 Join Danna and Tiffany Mladinich as they talk with special guest Dr. John A. Robinson of DrJohnARobinson.com and the founder of ThyroZone where he focuses his medical specialization on conditions of altered metabolism, particularly hormone imbalances and thyroid disease. He has developed a unique and refreshing approach to the treatment of thyroid disease called ThyroZone where patients find real solutions for their thyroid and metabolism issues. He is also the author of The Hormone Zone. It's going to be a wonderfully, informative show! Join us! Also, please check out our Radio Show Facebook Group, Hashi's & Graves Thyroid Nation RADIO, where we share updated guest info, answer questions, ask questions and help empower each other.